Squirrels come into our lives as a message to have more fun. Often times, we approach life too seriously, getting caught up in the hectic and chaotic trivialities of our daily activities and wasting the precious time that we have. These creatures, though, are great symbols of the opposite way of going through life. They live their lives in a well-balanced way, being both excellent, responsible planners and boisterous play mates. For humans, the squirrel animal totem serves as a common reminder of the importance of play. We can see this in both their behavior and the pattern of the tracks that they leave. Another aspect of their symbolism focuses on practicality and resourcefulness. For example, squirrels think about their futures when they save and store their food, returning to it in the cold and barren winter months – they are not all play with no work, after all. In safeguarding their provisions, squirrels teach us to examine our own resources and methods of securing them. While we should seize each day and live it to the fullest, we must also remember to have some awareness of our future and how to ensure its stability. We can observe both sides of their dual personalities in nature and would do well to not ignore it. Squirrel spirit guides may leave tracks in the dirt or snow to ensure that their messages are not lost with us. They seek to guide us and help us along our respective paths. 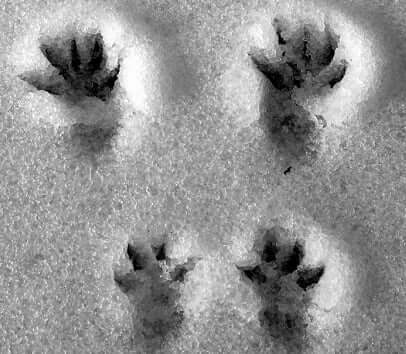 Like all other animal tracks that we find in nature, squirrel tracks offer valuable symbols that can greatly nourish the spiritual aspects of our lives. Quick little scurriers as they are, squirrels leave tracks that demonstrate their rapid movement. The prints represent fun, liveliness, and play, in addition to deeper messages such as preparation and resourcefulness, attributes that describe this animal well. The direction that the squirrel tracks point toward are also highly indicative of specific meanings. Are they moving forward and into a bright new future, or do they appear to move backward? In this case, you can interpret that the tracks are speaking to you of analyzing your own past and present. What can you learn from previous experiences and how can that guide you along your current path? A squirrel’s prints can also direct your focus onto your past, present, and potential future relationships. Use what you have learned in your past to strengthen old relationships and develop new ones. Likewise, examine any negative relationships that you have found yourself in. Utilize those experiences to prevent it from happening again. Various ideologies and cultures have looked at the direction of squirrel tracks through different lenses. The zodiacs of the sky are highly reliant on directions, as well. In the western sky, the symbol of Scorpio represents water and emotions. Alternatively, the Taurus of the east signifies the grounding of the Earth. Celtic symbolism recognizes the west as the beginning of motion – a journey, perhaps – toward new beginnings along the path to the east. On the other side of the world, many Native American tribes believe in directional symbolism, as well: things conclude in the west and ascend in the east, just like the rising and setting sun. We can use these ideas in our own exploration and interpretation of squirrel tracks. Pay attention to the pace and direction of the imprints to determine what message the creature was trying to leave for you. Ask yourself which symbolic meanings and analyses fit your current life situation best and begin to allow yourself to be guided by them. In doing so, you enable yourself to make a strong connection with the Earth in addition to gaining new perspectives and insights into your own life.